Our board-certified Radiologists and our qualified technicians at Alhambra Hospital Medical Center are dedicated to providing the most complete full-service outpatient imaging services available. 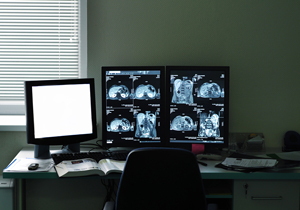 Our board-certified Radiologists are always on site and work hand in hand with our highly trained technologists. You can feel confident that your exam is performed on the most technically advanced imaging equipment and that exam results will be available the same day. As we add more advanced scanners to our arsenal, we can take images of your body's structures with remarkable clarity and detail, making diagnosis even faster and more accurate. Alhambra Hospital Medical Center's Nuclear and Radiology Department services are accredited by the American College of Radiology. This accreditation represents the highest level of image quality and patient safety. It is awarded only to facilities meeting ACR practice guidelines and technical standards after a peer review evaluation by board-certified physicians and medical physicists who are experts in the field. From the Emergency Room to Outpatient Procedures, you may elect to undergo any of the following imaging tests. Modern medicine wouldn't be what it is today without high-tech diagnostic imaging. Our physicians rely on imaging tests to diagnose disease and injury. In this rapidly evolving medical field, we've made a commitment to stay at the forefront. A nuclear medicine exam is a safe and painless procedure which utilizes radioactive material to detect, diagnose and treat certain diseases. Nuclear medicine differs from other exams, such as X-ray, CT or MRI, because it images organ function, rather than just the anatomy. This means that it can show how an organ is working, not simply what it looks like. This allows us to study the activity of many organs including the thyroid, heart, stomach and kidneys. Nuclear medicine is also well known for imaging the bones and joints to detect a number of abnormalities, including trauma, fractures, arthritis or tumor. The Department of Nuclear Medicine is a full-service nuclear medicine department which performs both diagnostic and therapeutic procedures. Perhaps no other type of scanner is as utilitarian as CT. These scanners use powerful, focused X-ray pulses to capture detailed cross-sections of the body, including soft tissues, bone and blood vessels. CTs are useful for detecting cancers  such as brain tumors or cancer in the lungs or abdomen  kidney stones, bleeding, infections and fractures. In Alhambra Hospital's Emergency Room, our CT scanner is invaluable for fast scans of traumatic internal injuries, as well as rapid diagnosis of strokes. We are pleased to announce that Alhambra Hospital Medical Center now has the Toshiba Aquilion™ 128 CT scanner, the most advanced 128-slice CT scanner available. The Aquilion delivers uncompromising image quality  showing even the smallest vessels and tissue, like those in the heart and lungs  for quick and precise disease detection. Low-Dose CT Lung Cancer Screening  What is it? Early detection is a proven, successful strategy for fighting many forms of cancer. Alhambra Hospital Medical Center offers screening with low-dose computed tomography (CT) for people at high risk for lung cancer, the only recommended screening test for the disease. CT lung screening is a noninvasive, painless procedure that uses low-dose x-rays to screen the lungs for cancer in just 30 seconds. A CT lung screening allows the radiologist to look at different levels, or slices, of the lungs using a rotating X-ray beam. It is performed on a multi-slice spiral computed tomography (CT) scanner and can detect smaller nodules or cancer than standard chest x-rays. A tumor or nodule is a mass of extra cells that grows on the lungs. It can be benign (noncancerous) or malignant (cancerous). By detecting malignant tumors in an early stage with CT lung screening, intervention can occur at a time when the cancer still has promising survival rates and is localized to the lungs. To schedule an appointment, please call (626) 300-6830. A doctor's referral is required. During the exam, patients lie on their backs on an exam table with arms above the head. They must hold their breath briefly as the pictures are being taken. For a short period of time, the body may be covered by a scanner, but the scanner is open at the back and front so that the patient can see out. The technologist is always able to see and hear the patient during the 15-minute procedure. Why is Lung Screening Important? Lung cancer is the leading cause of cancer-related death in the United States. Three out of four people with lung cancer have incurable, locally advanced, or metastatic disease at the time of diagnosis. Their five-year survival rate is less than 5% when diagnosed with stage IV lung cancer. Detecting lung cancer at its earliest stage, and having it surgically removed, means a person can expect a five-year survival rate closer to 53%. Yet only 15% of cases are diagnosed at such an early stage. It is estimated that over 80% of lung cancers could be cured if detected at an early stage. Unfortunately, only 15% of lung cancers are caught at this stage, making the 5-year survival rate for all stages of lung cancer 20%. Catching lung cancer in an early stage, while it is still localized to the lungs, is essential. A person's chance of survival decreases when the tumor grows to be 3 cm or more. If the cancer spreads to areas of the body outside the lungs, the survival rate is only 3%, compared with 48% if the cancer is just in the lungs. CT lung screening is extremely capable of detecting lung nodules as small as 2 or 3 cm. By catching malignant tumors when they are still small, they can be removed before the disease spreads to other areas of the body. Who Should Have Lung Screening? Follow-up screening is recommended every 1 to 2 years for patients who remain at high risk. It is important for patients to be aware that having a negative scan (no nodules or cancer) does not mean that lung cancer will not develop in the future if they remain at high risk for the disease. How Accurate is Lung Screening? Recent studies show that CT lung screening is more sensitive than standard lung screening methods (i.e., chest x-ray, sputum cytology) in detecting lung cancer. Unlike standard chest x-rays, CT lung screening takes cross-sectional images of the lungs. This allows the radiologist to see the lungs from top to bottom. Chest x-rays only show views of the lungs from the front and sides. With 3D imaging, CT lung screening can measure the growth of tumors in all directions, whereas standard x-rays can only measure tumors at their widest point, preventing the radiologist from tracking changes in the volume of the tumor. Does the Procedure Involve Radiation? CT Lung Screening does involve exposure to radiation in the form of x-rays, but the benefit of an accurate diagnosis far outweighs the risk. The effective radiation dose from this procedure is about 1 to 1.5 mSv, which is less than the average person receives from background radiation in six months. Is Lung Screening Covered by Insurance? Most insurance companies do not cover screening procedures. Please note that cash payment is due at the time of your procedure. The special price for this screening is $130. (with physician order). If you do not have a physician order, the special cash price is $250.00.